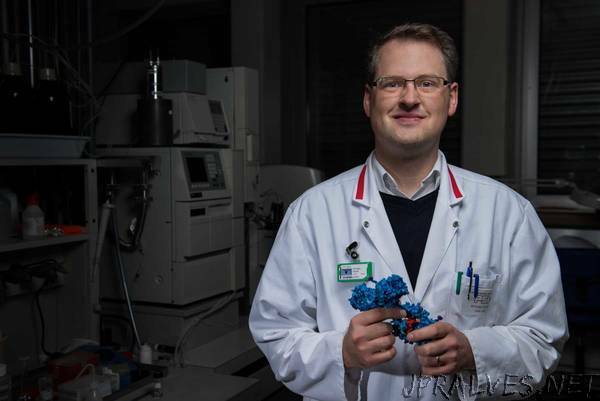 “With a new method for modifying antibodies, Philipp Spycher wants to develop drugs that are more stable and, thus, have fewer side-effects. Isaac Newton is said to have had his “Eureka!” moment when an apple fell on his head. Philipp Spycher had the idea that inspired him in a Key West hotel room in August 2015, when he couldn’t sleep and needed to get moving. At the time Spycher, a postdoctoral radiopharmaceutical researcher at the Paul Scherrer Institute PSI, was concerned with the question of how active agents could be bound to antibodies more efficiently. That’s because, in combination with an antibody, the active agent can target the diseased cells in the body and, thus, can take effect in the right place. With the conventional method, the active agent is chemically attached to the antibody. This process creates a mixture of different compounds, each of which binds the active ingredient to the antibody at a different site. The mixture is difficult to analyse and can cause serious side-effects. Spycher hit on the idea of pursuing another approach in which, by means of enzymes, the active ingredient can be tacked onto the antibody directly at the optimal site, precisely and without great effort. As a result, these so-called antibody-agent conjugates can be produced more rapidly and at lower cost. Also, drugs made in this way should be better tolerated and more effective. As a child Philipp Spycher, 34, already had the urge to explore. As a teenager, he read popular science magazines such as Bild der Wissenschaft and Spektrum der Wissenschaft. From this he learned about the revolution that was taking place in life sciences: nanotechnology promised to harness nature with a precision never known before. Spycher was especially fascinated by one idea: nano-robots that destroy cancer cells. Cancer is an issue in our family, Spycher says. His grandmother and an uncle died from it. After graduation, he studied nanosciences in Basel and biomedical technology at ETH Zurich. In his doctoral research he investigated how molecules could be modified for cell studies with enzymes and, to further this research, he took a postdoctoral job at the Center for Radiopharmaceutical Sciences at PSI. Without the first class infrastructure, the supportive environment of my group and the great freedom, I would never have been able to realise my idea in this way, Spycher says. In spring 2017, he tested the idea that he had that night in Key West and discovered, surprisingly, that his approach works for all known antibodies and a large number of active agents.